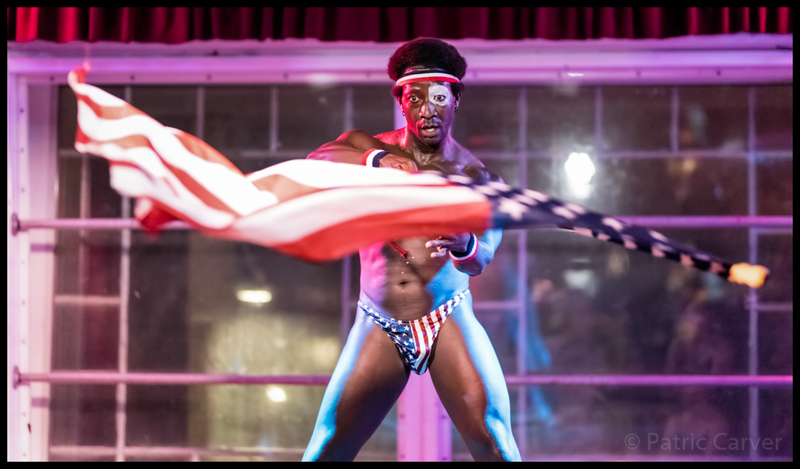 Monday Night Hubba - Blacks Arts Matter: Juneteenth (photo: Patric Carver)Hubba Hubba Revue hosts a cozy burlesque affair in the upstairs annex at DNA Lounge every Monday. 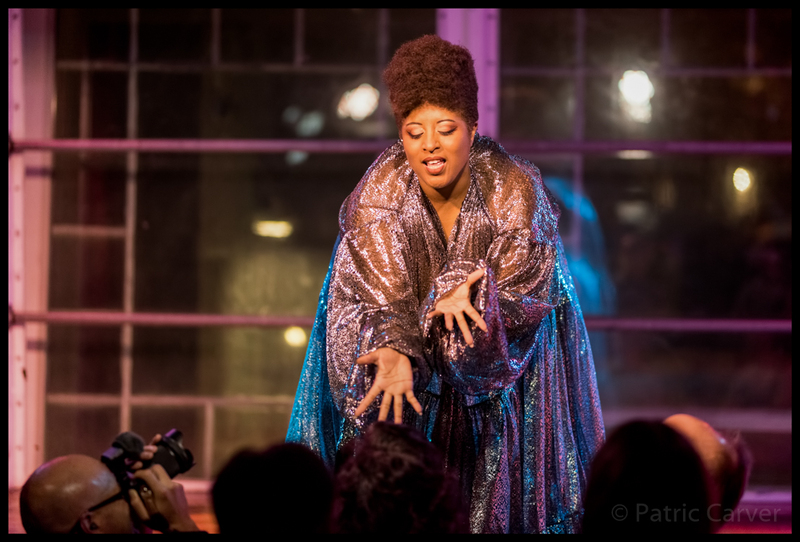 This past Monday, the theme of the night was Black Arts Matter: Juneteenth. 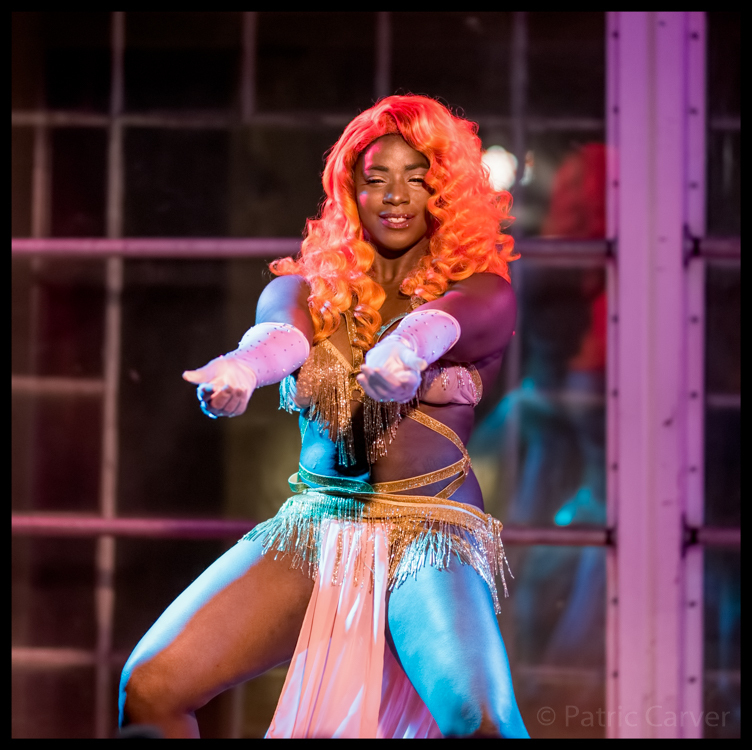 Hosted by producer, performer, and all-around delight Mone’t Ha-Sidi, the lineup for the night was packed with talent. 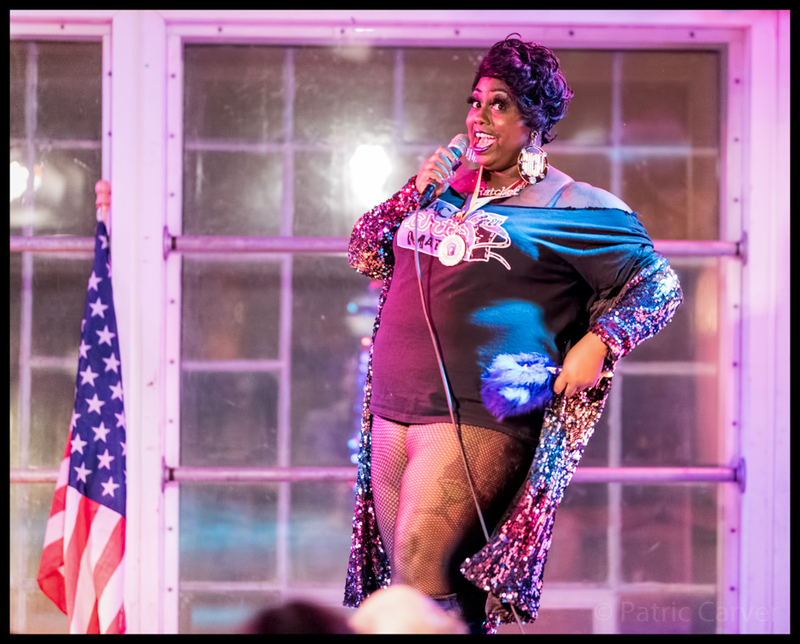 Ha-Sidi, founder of Black Arts Matter and Jezebelle’s Army in Sacramento, was fresh off her wins for Master of Lip Sync and Second Best Overall at the Utah Regional Burlypicks. She wore her medals like the champion she is as the crowd gathered. Talking to Ha-Sidi, it is hard to believe that anyone would ever find fault with her. She’s incredibly generous with her spirit, constantly mentioning other performers with gratitude for their support and influence. 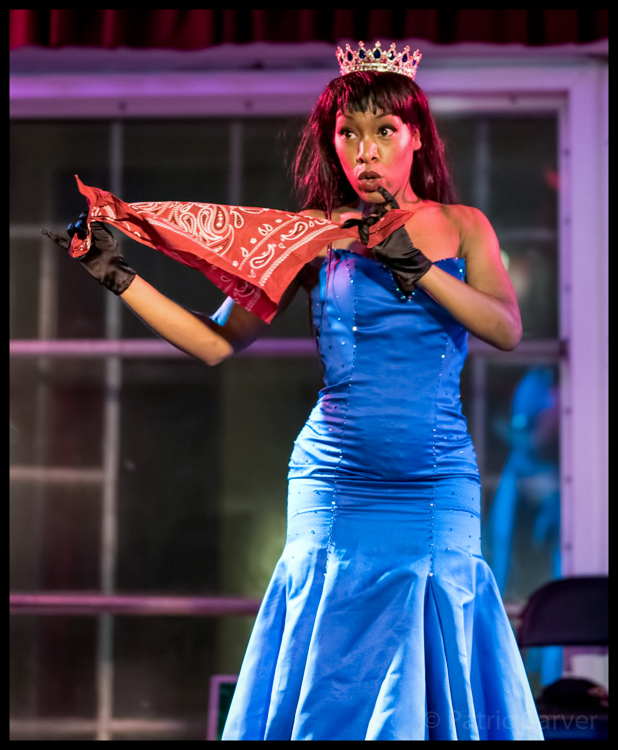 However, the world isn’t a very nice place often, and Ha-Sidi also expressed the difficulty of being a larger Black femme performer in Sacramento. “I could talk about my experience in The Bay or my experience in Sacramento, but I have to do so separately because they’re two different things,” she said. Ha-Sidi went on to describe a mostly welcoming and supportive climate in the Bay, but the tone turned when she spoke of her hometown of Sacramento. She described instances of being harassed online — including the release of her personal information, and even two particular altercations in which she was threatened with a brick and had eggs thrown at her face while conducting a peaceful protest. Ha-Sidi’s treatment is a sobering reminder of the anti-Blackness and anti-woman factions that exist in California, a state that from the outside is often held up as immune to such issues. Still, Ha-Sidi manages astoundingly to bring beauty into this sometimes very ugly world. 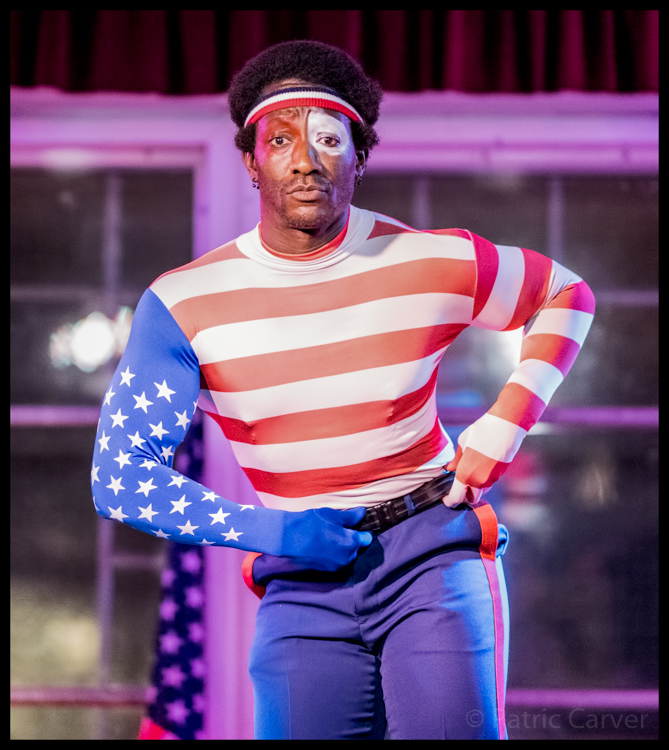 The Blacks Arts Matter show itself was stunning. 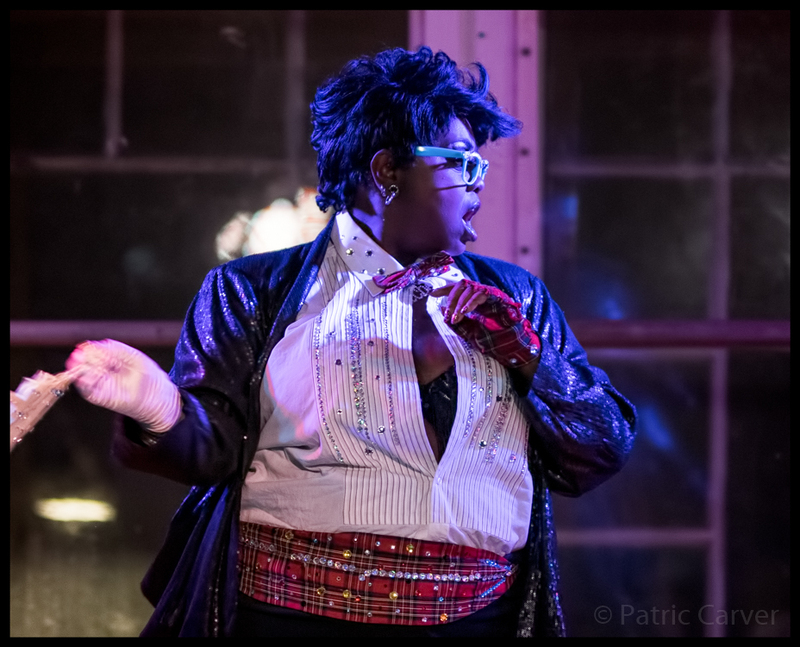 There was a political thread strung throughout the night, started by Ha-Sidi’s innovation of “No Scrubs” as “No Trump” in which she lambasted the “squatter in the White House.” Her rhymes were playful without being Weird Al zany (though there’s nothing wrong with that). 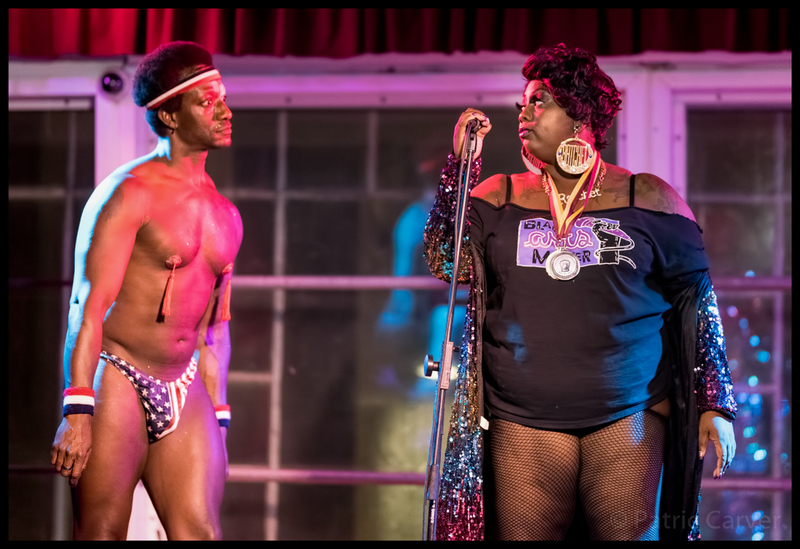 It seemed that performing these complicated parody was as easy as putting on lipstick, and it really set the tone for the evening — solid performances of substance by performers who live their art. 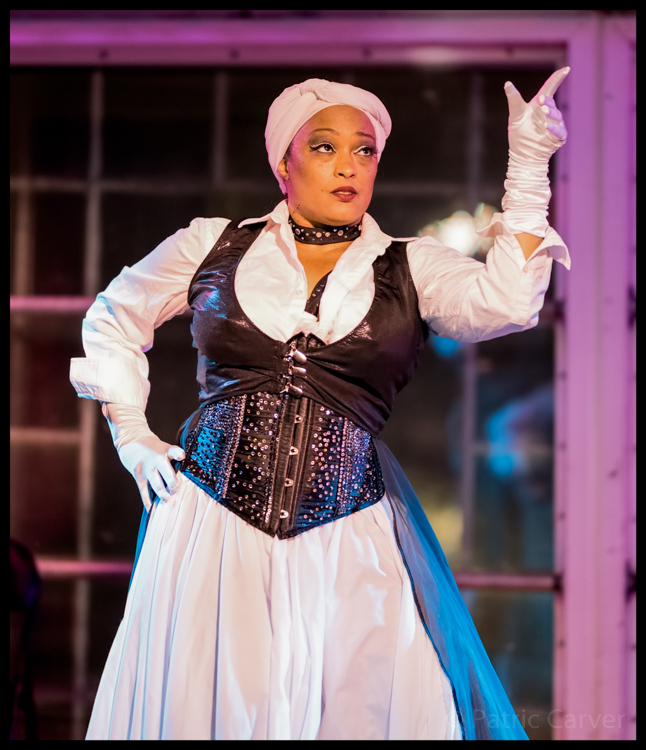 It’s hard to believe that Ha-Sidi has only been in the burlesque game for a decade — she seems to have been born into the work. Honestly, the same could be said for the other performers of the night — there wasn’t a lackluster act among them. Some of the acts verged on the more traditional. 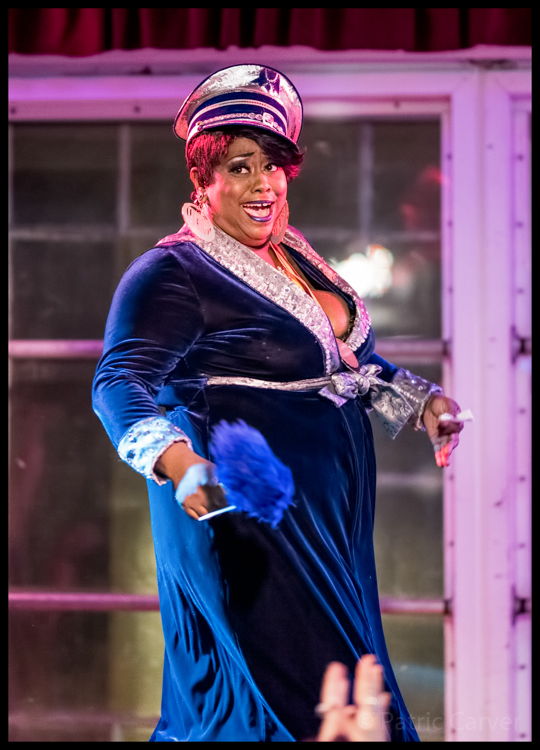 Introduced as the “L.A.-sexual Intellectual,” Caramel Knowledge performed a very old-school, sultry piece that put the lush in luscious. If crushed velvet were a person, it would be Caramel. 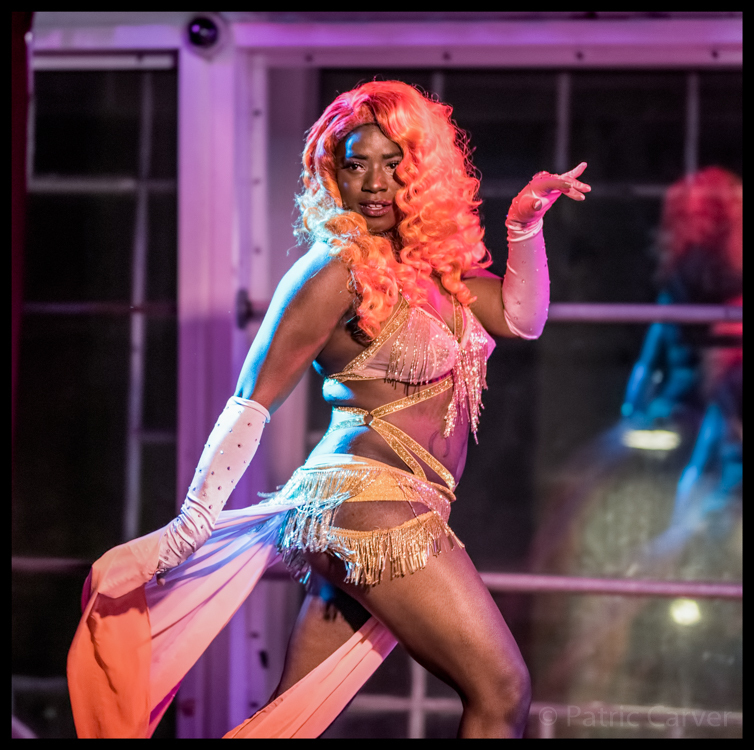 In a similar vein, Takillya Sunrise lit up the stage in a fiery orange wig with moves to match, and Dhalia Kash toppled with tease. The crown jewel in this list of treasures, though, was Alotta Boutté. 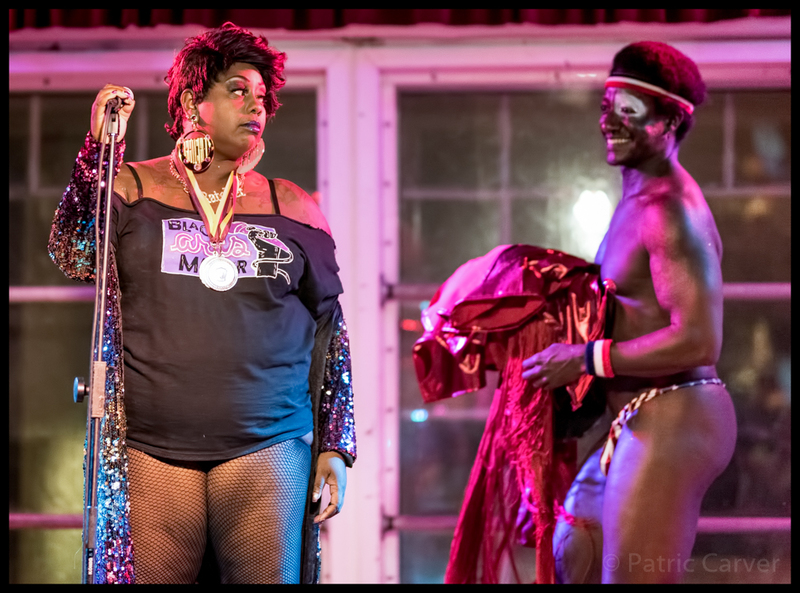 Self-described as “the girl my mother warned me about,” Boutté had a tease-laden robe act that sent Cookie Wolf absolutely howling from the front row. Some of the acts were more theatrical in nature. 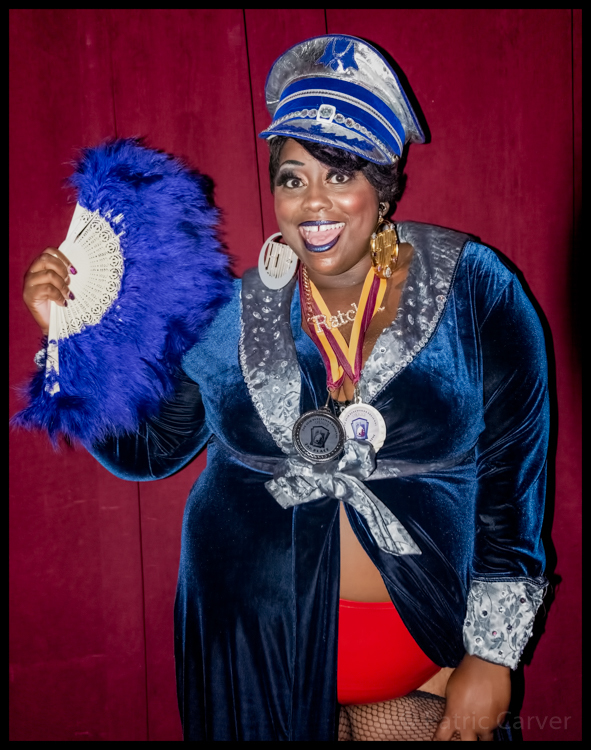 Co-presenter and fellow performer Sweet Belize of Bay-Area-based Dem Foxy Femmes was kittening for most of the night, and her energy on and stage presence seemed endless. 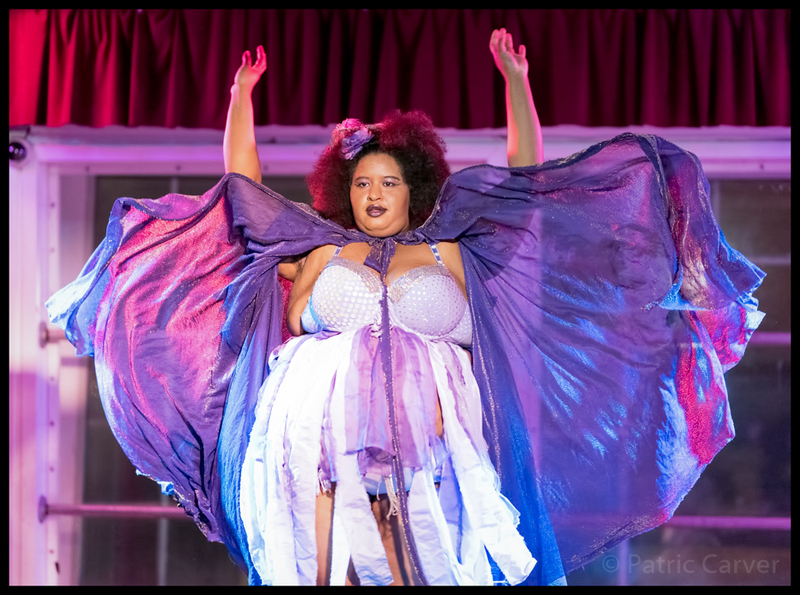 She proved that to be the case when taking the stage for her own act, a costume-driven reveal-upon-reveal that transformed Belize into different personas. 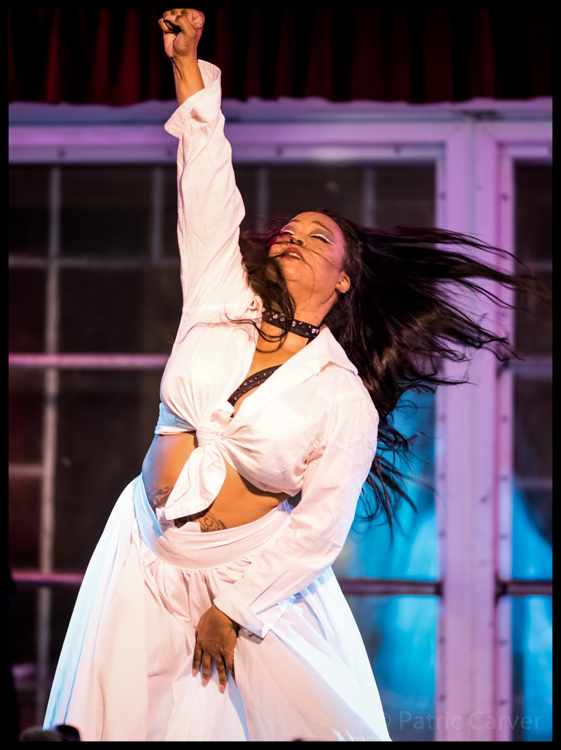 Her moves were exact yet fluid. I’m not a big fan of lip sync as a medium — I think because there is so much bad lip sync out there, it distracts from the act when it isn’t done well. Belize was spot-on. 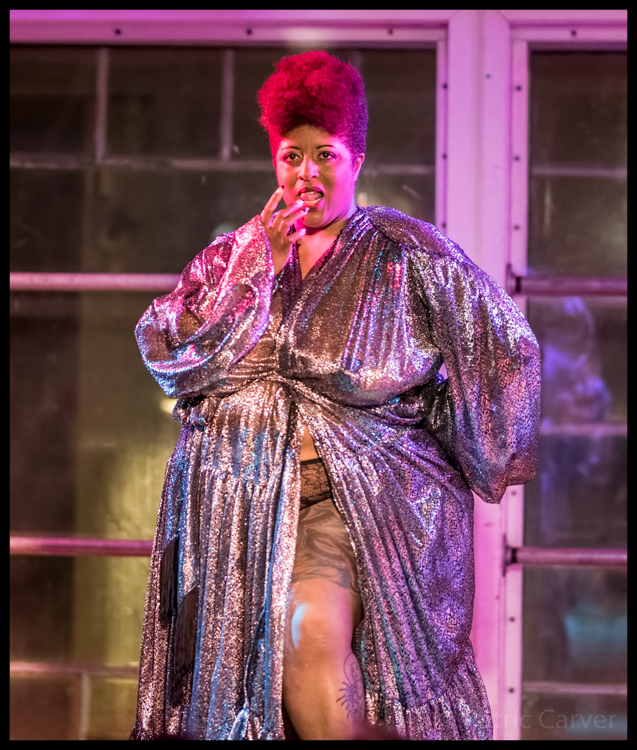 2016 Burlypicks Winner Egypt BlaqueKnyle also did a transformative piece that hinged on costuming. Her movements were positively poetic; I can see why she has been recognized by so many outfits. 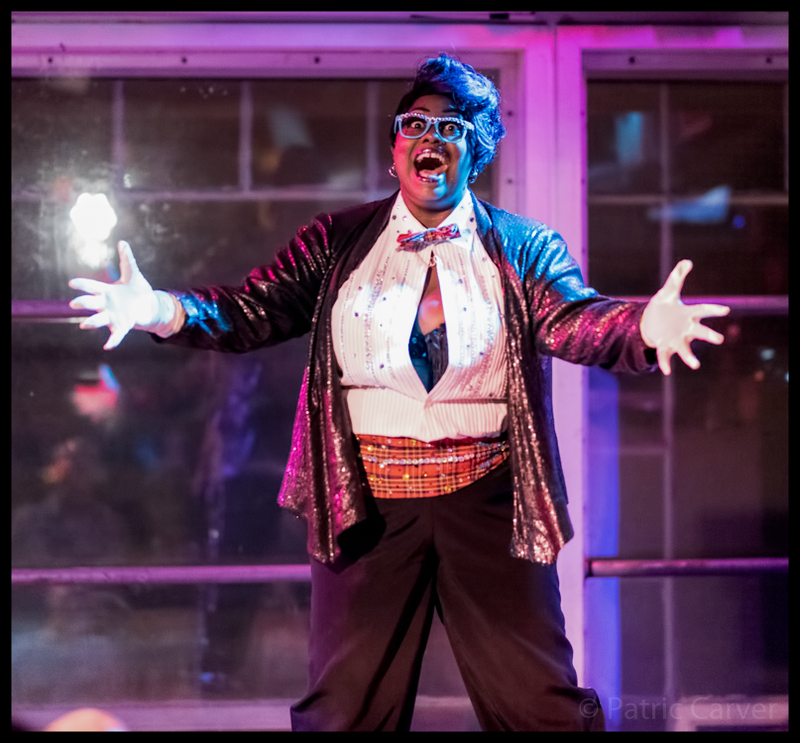 I can’t think of very many people who can compete with the strength and grace of Nina Simone’s “Four Women” on the stage, but BlaqueKnyle is definitely one of them. 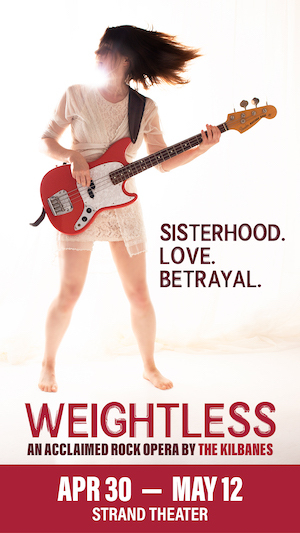 The song fit seamlessly into her act and it was a beautiful marriage. 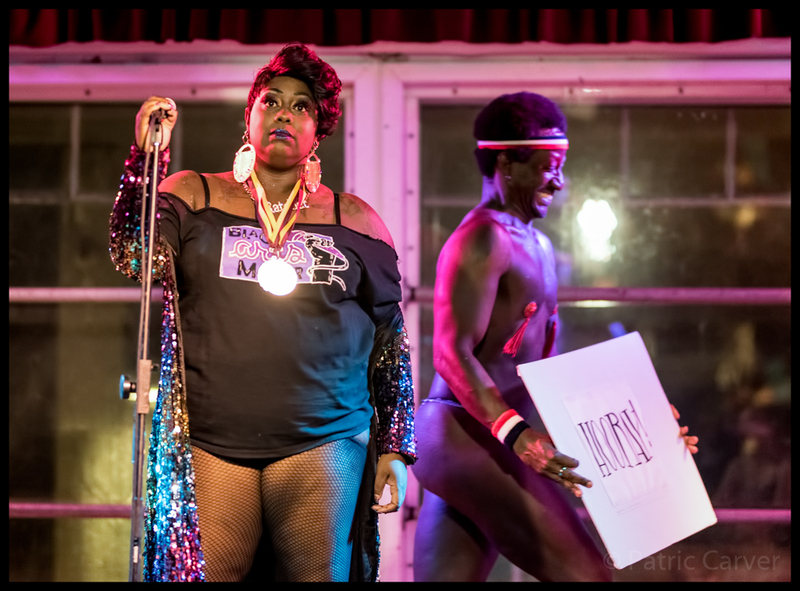 Jet Noir took us on a funk-laden ride set to Prince and the Revolution’s “America” bisected with David Bowie’s “I’m Afraid of Americans.” Honestly, Noir could sit on the stage and flash that smile and that would be enough for most folks to feel like they’ve gotten their money’s worth. He is one of those people who radiates good, and you can feel it a mile away. Yet, he isn’t just a pretty face (or perfectly-toned bottom). 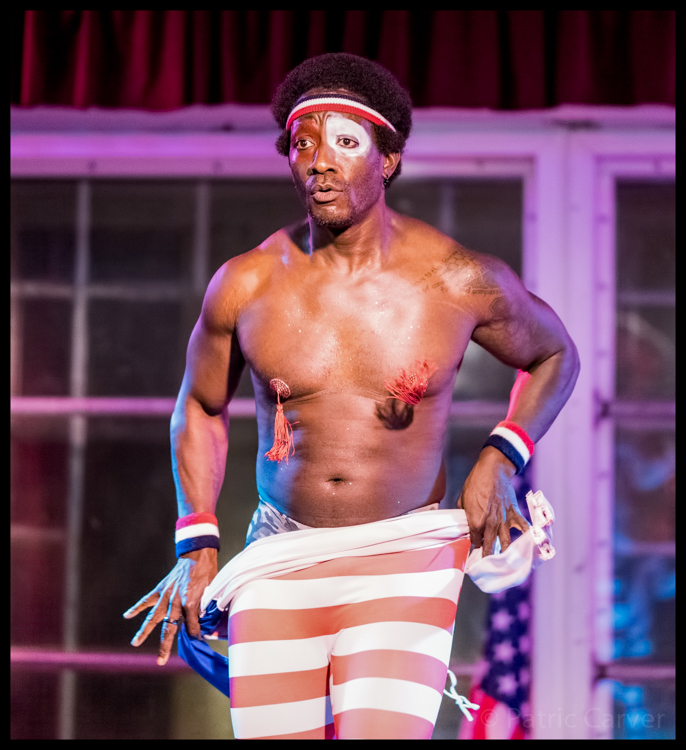 His act was poignant as well as pretty, and the mix of slightly comedic striptease with the powerful image of a Black man lying on the floor and rising a single fist rising was something running through my head long after the curtain closed. Noir throws powerful imagery like confetti. 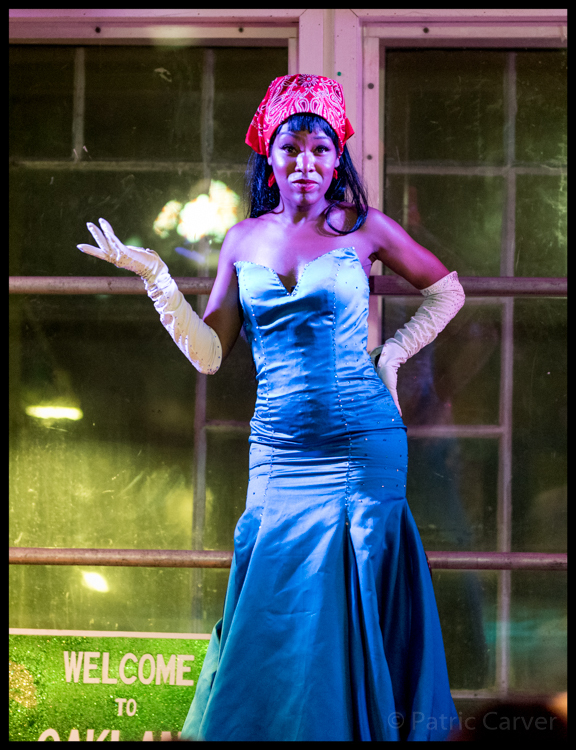 The absolute show-stopper of the night, however, was host Ha-Sidi. 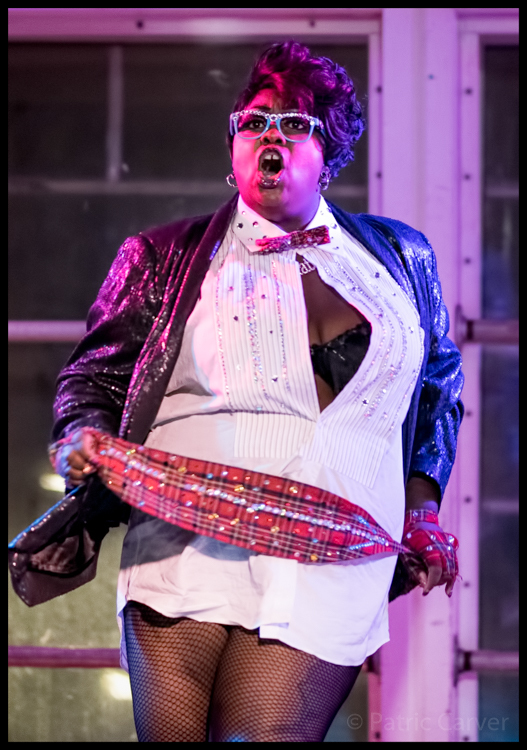 During her own act, she tripped the light fantastic through two cultishly iconic pieces: a portrait of Rocky Horror’s Brad Majors and Talking Head’s “Once in a Lifetime.” Ha-Sidi has incredible control of her facial expressions on stage. Like the aforementioned Noir, Ha-Sidi has so much drama just between her forehead and chin that the rest of the act seems almost unnecessary — she could give any stage actor a run for their money. But, oh, how glad I am that the rest is all there. She spoils her audience with entertainment. 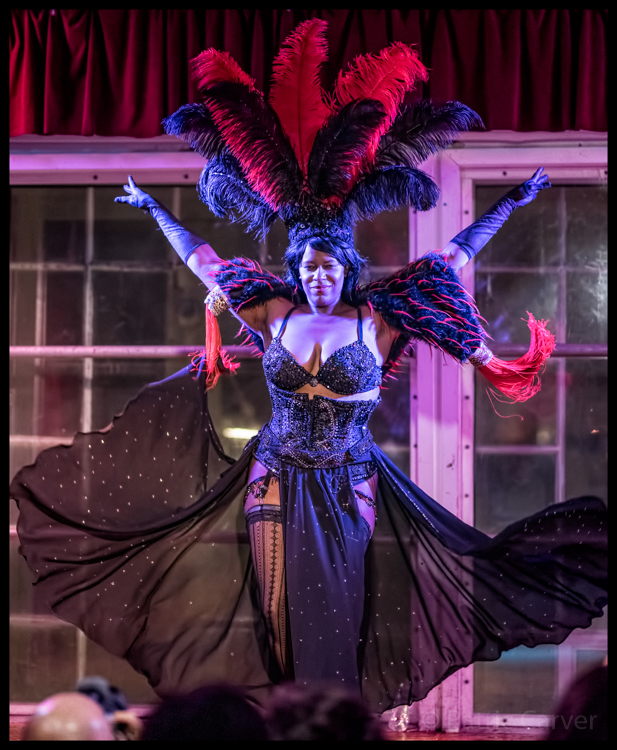 She is neo-burlesque. If you have the opportunity to see any of these performers in the near future, do yourself a favor and go. 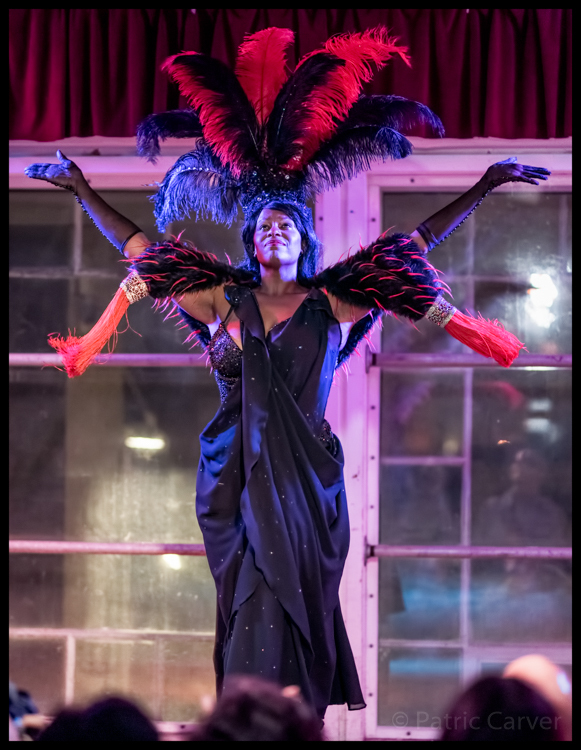 So much beauty, balance, and brightness was packed into one night on the DNA lounge stage, I’d be fortunate to see any one of these performers up there again. Listen to Oakland artist Baeilou's beautiful "Eleanora"